Sweet Indrajao (Wrigtia tinctoria) is a small, deciduous tree with flowers that look like snow flakes. Native to India and Burma, Wrightia is named after a Scottish physician and botanist William Wright. The leaves of this tree yield a blue dye called Pala Indigo. The wood of this tree is used for making Channapatna toys. The wood is suitable for matchboxes, bobbins, engraving and printing-blocks, mathematical instruments and rulers. It is also suitable for stained wood inlay-work. A survey conducted showed that tribal people in Chhattisgarh district control diabetes with their own drugs prepared from plant sources proving the effectiveness of the traditional system of medicine, one of the trees being Wrightia tinctoria. Its astringent, anti-inflammatory and antibacterial properties make it ideal to treat a broad range of skin disorders. The leaves are applied as a poultice for mumps. Munching a few leaves relieves toothache. It has anti-inflammatory and anti-dandruff properties and hence is used in hair oil preparations. It is considered to be very effective jaundice plant in Indian indigenous system of medicine. Are you aware that this tree can be found in Bangalore in different parts of the city? There a few trees in Lalbagh botanical gardens. If you want to know more on trees be a part of the Tree festival, Neralu. With a sincere urge to create awareness among people of Bangalore, a group of tree enthusiasts consisting of naturalists, ecologists, technologists, visual artists, performing artists, writers, homemakers, photographers, storytellers, historians and citizens have come together to envision and put together this tree festival for the city of Bangalore. This festival has been christened “NERALU (ನೆರಳು)”, meaning shade in Kannada and is scheduled for the 8 and 9 February 2014. A green and peaceful venue in the heart of the city, Cubbon Park, has been chosen as the hub of activities during the 2 days. • Heritage, ecological and cultural walks beneath the canopy at the renowned heritage and public park of Bangalore, Cubbon Park. Why are Bangalore’s trees falling? Neralu, Bangalore’s very own Tree Festival, the first of its kind in the city, is taking place on 8 and 9 February, and promises to have something in store for everybody. Escape the chaos. Let’s go underground! 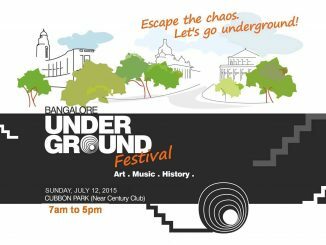 Watch Bangalore’s artists, musicians, dancers, and actors reclaim the space under the streets at the Bangalore Underground Festival on July 12th. Tell your tree story and show your love for trees in the form of photographs for Neralu 2015. Selected photos will be displayed at the photo exhibition at the festival.